Hunting down America’s public enemies was just one of the FBI’s jobs. Another—perhaps more vital and certainly more covert—was the job of promoting the importance and power of the FBI, a process that Matthew Cecil unfolds clearly for the first time in this eye-opening book. 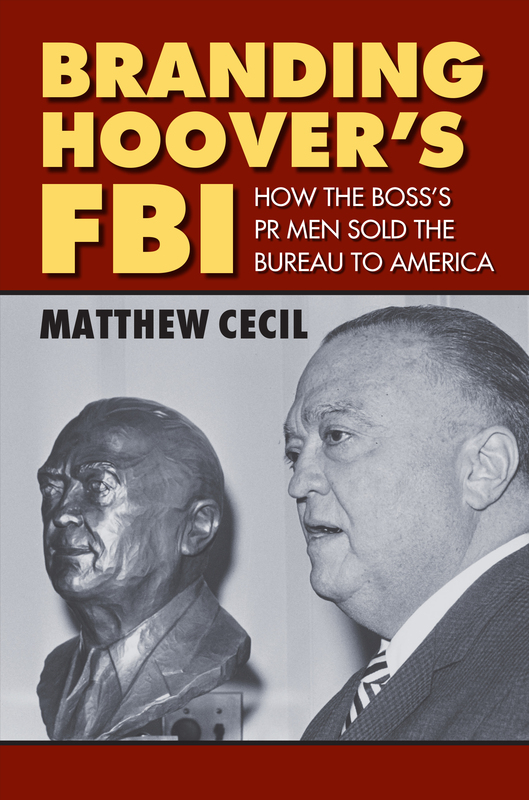 The story of the PR men who fashioned the Hoover era, Branding Hoover’s FBI reveals precisely how the Bureau became a monolithic organization of thousands of agents who lived and breathed a well-crafted public relations message, image, and worldview. Accordingly, the book shows how the public was persuaded—some would say conned—into buying and even bolstering that image. Just fifteen years after a theater impresario coined the term “public relations,” the FBI under J. Edgar Hoover began practicing a sophisticated version of the activity. Cecil introduces those agency PR men in Washington who put their singular talents to work by enforcing and amplifying Hoover's message. Louis B. Nichols, overseer of the Crime Records Section for more than twenty years, was a master of bend-your-ear networking. Milton A. Jones brought meticulous analysis to bear on the mission; Fern Stukenbroeker, a gift for eloquence; and Cartha “Deke” DeLoach, a singular charm and ambition. Branding Hoover’s FBI examines key moments when this dedicated cadre, all working under the protective wing of Associate Director Clyde Tolson, manipulated public perceptions of the Bureau (was the Dillinger triumph really what it seemed?). In these critical moments, the book allows us to understand as never before how America came to see the FBI’s law enforcement successes and overlook the dubious accomplishments, such as domestic surveillance, that truly defined the Hoover era. Matthew Cecil is Dean of the College of Arts and Humanities, Minnesota State University, Mankato. He is the author of The Ballad of Ben and Stella Mae: Great Plains Outlaws Who Became FBI Public Enemies Nos. 1 and 2 and Hoover’s FBI and the Fourth Estate: The Campaign to Control the Press and the Bureau’s Image, both published by Kansas.